Canis latrans var. is a fascinating species in the canine family. In Quebec we have slightly bigger coyotes than those in the west, because they have bred with wolves to become the “coywolf”, or Eastern Coyote. They are an opportunistic omnivore and will eat nearly anything, from deer and rabbits to raspberries and grasshoppers. Coyotes learn remarkably well about the behaviors of their prey and predators. They can adapt to many different ecosystems and circumstances, and are highly aware animals that can teach us a lot if we are lucky enough to find and follow their trails in a respectful way. Coyote is a symbol in many cultures around the world of a creature that embodies craftiness, cleverness, and creativity. 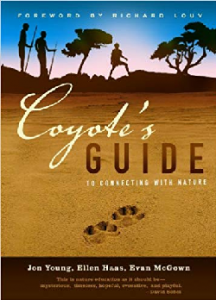 A teacher, a trickster, and someone who walks the edge of your awareness, coyote can draw you out into a deeper connection with the world. It is a symbolic role model for us as mentors and guides. Our namesake is also a homage to the lineage of the work we do – that of Jon Young and Tom Brown Jr. and their articulation of the Coyote Mentoring tradition. Since coyotes are found in Montreal, we encourage Montrealers to appreciate the role of coyotes in our ecosystems, and to learn to cohabitate with them. They help keep the numbers of herbivores in check (yes there are deer in Montreal, too!) and they teach the animals to be strong and aware. Fearing what we don’t understand isn’t as useful as humility and respect. Coyote attacks on humans are exceptionally rare, and interactions are uncommon. – Make yourself look big and loud if you want to scare them off. – Don’t leave your kids or dog unattended in an area where coyotes are known to be present.